Srila Prabhupada returned by 7:30 a.m. and entered the ground floor of the house for a short morning program. The downstairs consists mainly of a hallway, guest bedroom, pantry, kitchen, a large living room with an adjoining dining area. The devotees have put Srila Prabhupada's vyasasana, which is usually kept upstairs, in the dining room and a simple Pancatattva altar faces it from the opposite end of the living room. The yatra here may be small but is certainly not poor. The floor coverings in the living room are Persian Kashan carpets of navy blue and red floral design worth about $12,000 each. Srila Prabhupada mounted his vyasasana, a converted armchair covered with an orange brocade sari, to receive guru-puja from the enthusiastic devotees. Then at the end of the kirtana we all sat on the opulent rugs eager to hear his lecture. It turned out to be very short, hardly one minute, on Srimad-Bhagavatam 3.22.19. 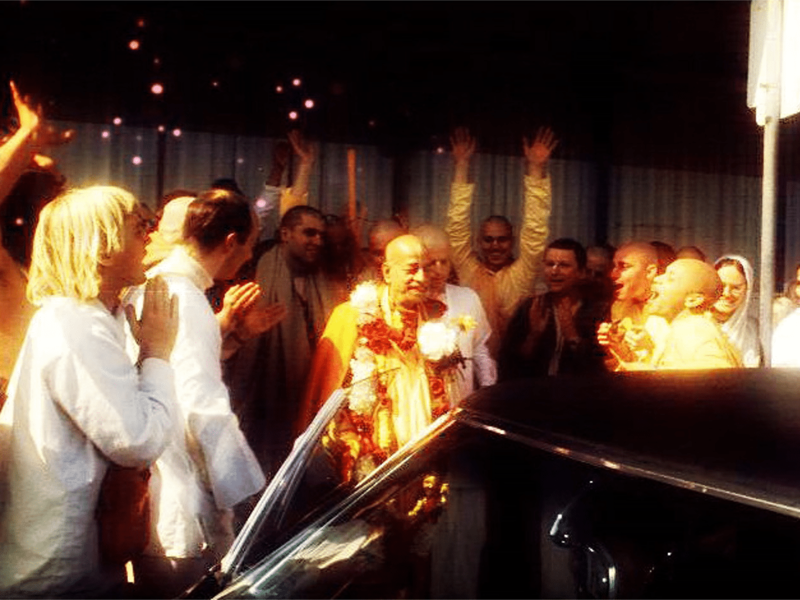 Prabhupada had Pradyumna prabhu read out the Sanskrit verse, the word-for-word transliterations, and translation. It described Kardama Muni's desire to marry, have a child, and then retire from family life. Pradyumna read the purport, which was exceptionally interesting: "According to Vedic principles, the first part of life should be utilized in brahmacarya for the development of character and spiritual qualities. In the next part of life, one may accept a wife and beget children, but one should not beget children like cats and dogs. "Kardama Muni desired to beget a child who would be a ray of the Supreme Personality of Godhead. One should beget a child who can perform the duties of Vishnu, otherwise there is no need to produce children. There are two kinds of children born of good fathers: one is educated in Krishna consciousness so that he can be delivered from the clutches of maya in that very life, and the other is a ray of the Supreme Personality of Godhead and teaches the world the ultimate goal of life. As will be described in later chapters, Kardama Muni begot such a child-Kapila, the incarnation of the Personality of Godhead who enunciated the philosophy of Sankhya. Great householders pray to God to send His representative so that there may be an auspicious movement in human society. This is one reason to beget a child. Another reason is that a highly enlightened parent can train a child in Krishna consciousness so that the child will not have to come back again to this miserable world.... "In the same order as Kardama Muni, about 100 years ago, Thakura Bhaktivinoda also wanted to beget a child who could preach the philosophy and teachings of Lord Caitanya to the fullest extent. By his prayers to the Lord he had as his child Bhaktisiddhanta Sarasvati Gosvami Maharaja, who at the present moment is preaching the philosophy of Lord Caitanya throughout the entire world through his bona fide disciples." Srila Prabhupada's few added comments were highly relevant to this small community of householders. "So householder life is not condemned; it is required. If there is no householders, then wherefrom the saintly persons will come? They will not drop from the sky. So everything is required. In our society, we have got householders, we have got brahmacaris, we have got sannyasis. So Krishna consciousness movement is a very scientific movement for the total benefit of human society. If it is properly carried out, then everyone will be satisfied and happy and go back home, back to Godhead. Thank you."